We’re on our way to Kushiro, departed from mainland Ofunato port this morning. The winds are light from the east forcing us too far north of our rhumb line. 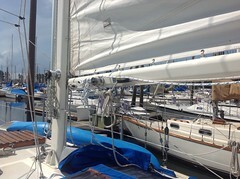 So far we’ve been fortunate and were able to sail on course with very little tweaking of sails. We may be motoring by tonight as the fickle winds swirl all around. Hoping to make this a “quick” 2-3 day passage as the cargo ship, fishing fleet, opposing currents and dense fog make sailing around Japan a little stressful, especially at night. The days are forecasted to be sunny but cold. 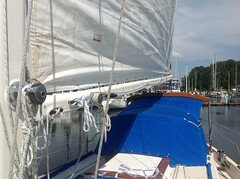 The water temp is down to 55 degrees, the interior of the boat is cool. We’re wearing our base layers with lite foulies for now. It’s John’s birthday but no cake or wine for a few days. We’re saving our propane for the long trek across the Aleutians. 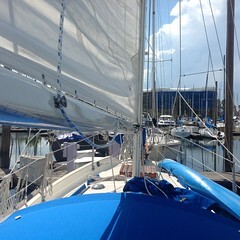 Back to the sails, wind just died. All is good aboard Konami. We waited out two blows, one from the South that lasted four days, turned 180 degrees for two days from the North. The unanticipated stop brought the Japanese coast Guard to the port inquiring about our destinations. As usual very polite but overly suspicious of our intents. So now we’re on our way to Oaraii port, about 110 miles, an overnight trip. 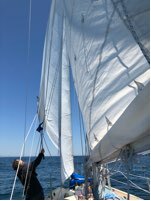 The seas are calm with a long easterly swell with 1.5 knots of adverse current and no wind to help fill in the boat speed. Crew are doing well, happy to be underway once again. 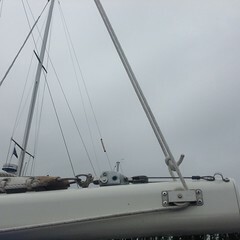 We’re leaving behind new sailing friends who were so helpful and a real pleasure to be with. We will think of them often as they freely sail around Japan’s coastline in their Flicka 20′ sailboat. Thanks for all the yummy food and safe wishes for our safe journey Mr. and Mrs. Yagi. !! Saying goodbye to Japan. 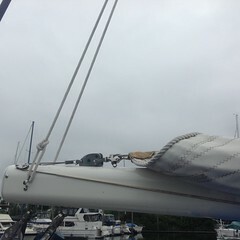 Departed our Japanese home, bound for Tannowa to haul out for q quick bottom cleaning. All of our friends were on the dock, toasted Neptune and wished us a safe voyage. We are so very sad to say goodbye!